Located near Albert Park Lake in Melbourne is a new 12-storey luxury residence. The project has many distinctive features, such as glazed spandrels that punctuate an angular façade, coloured precast panels, clear balustrades, and dark window frames and louvres. Lakeside, as it is known, was designed by Fender Katsalidis Architects and constructed by Hickory Group. The residential project offers a total of 159 new apartments. One of the highlights of the building is its contemporary and elegant lobby. 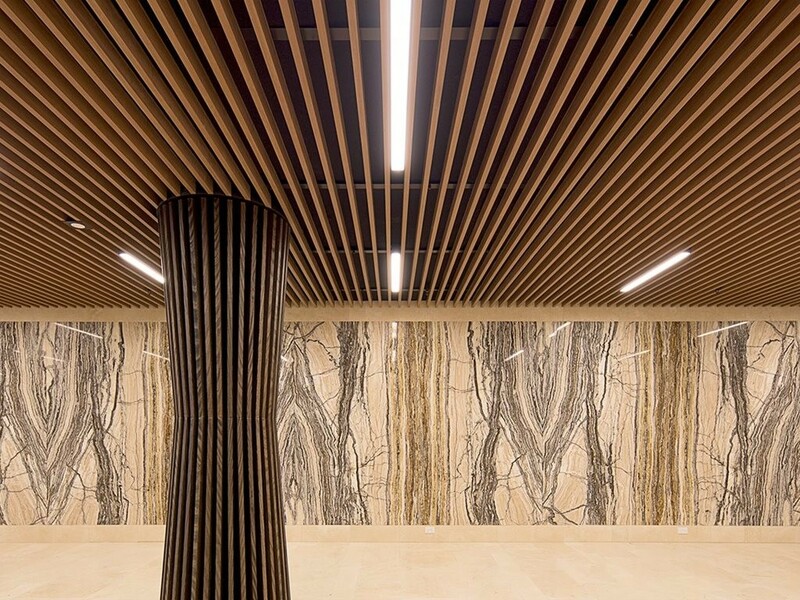 The design and build teams worked closely with Covet International to envisage a lobby ceiling design that was practical, simple to install, and beautifully finished. Kabebari two-section aluminium batten profile in a textured Ever Art Wood® timber-look finish was chosen from Covet’s range of products to meet the desired effect. Covet supplied a custom black T-section that was affixed to steel ceiling rods. From there, the builders fastened the aluminium battens to the T-sections, which resulted in a ‘floating’ batten ceiling. The ceiling is visually interesting and practical, with space left over for acoustic infill – a key element of apartment building design – and access to the plenum space. At only one kilogram per linear metre, the product is extremely lightweight, meaning the project team were able to lower their material costs by minimising the amount of support structure needed for the ceiling. As one of the first things to greet residents as they enter the building, the suspended batten ceiling helps to create a sense of warmth and luxury – the perfect environment to come home to. Cladding profile: Kabebari concealed fix 30x85 batten & T2C system. Want to achieve a similar look for your project? Click here.